It's Winter-time! Or at least it is if you live in the Southern hemisphere. At the moment is it 4:45pm in Sydney Australia and the sun has only a few more minutes before it sets behind the harbour bridge. The temperature is 11 ºC / 51 ºF but will quickly drift down lower once the sun has gone down. 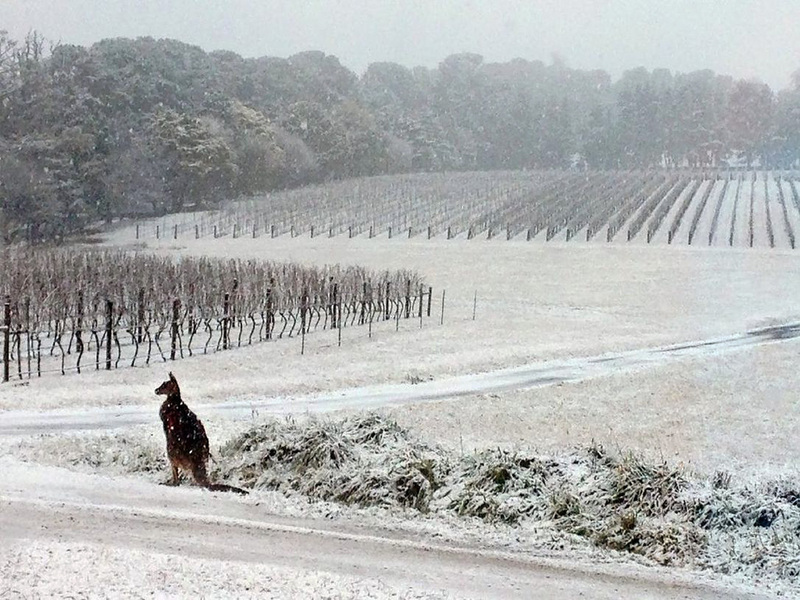 Of course meanwhile in the north, it is anything but mid-winter, with sweltering temperatures and heat advisories. Such a contrast. 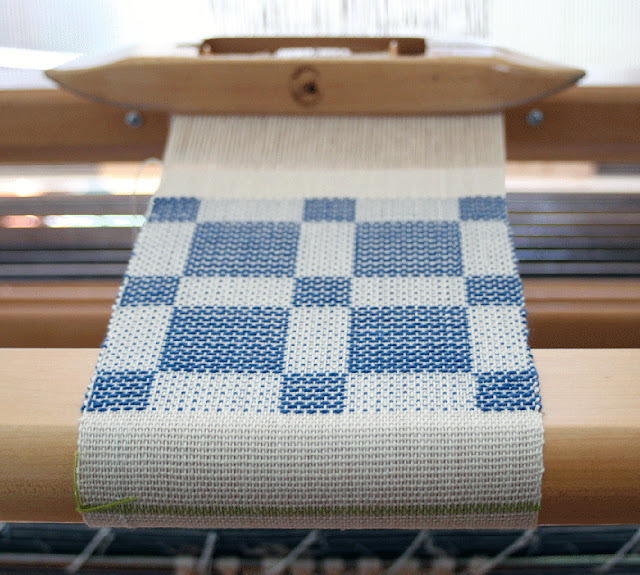 I was musing on this the other day while I was sorting through some old weaving books and was reminded of the weave structure called "Summer and Winter". This is a technique that is often worked with simple blocks and a limited range of colours but giving stunning fabrics. The main feature of Summer and Winter is that the technique produces a reversible fabric, with one side usually lighter in colour and the other side darker. You can use the light side during the long summer days but then flip it over to give a second look for the winter months. So I thought it might be fun to contrast pairs of knitting patterns, both similar in some way, but with a very different climate in mind for each of them. Today I thought I'd start with two sideways-knitted scarves. I enjoy knitting items sideways. It can be a lot of stitches to cast on at the start of the item, and of course each row lasts f-o-r-e-v-e-r, but I love that meditative feeling that descends on you as you work the same pattern over and over along the row. 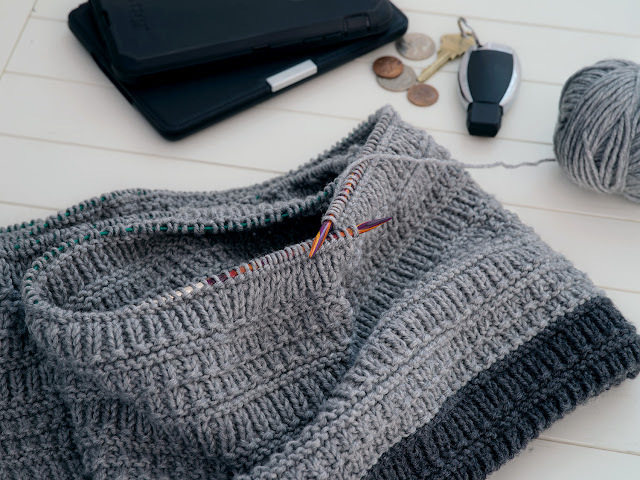 I have written before about the joys of knitting designs that are worked lengthwise. In that blogpost I was writing about a wrap version of the Kimpton Scarf shown above, one of my all-time favourite summer knits. It's perfect for throwing around your shoulders as you sit on the beach watching the sunset or in a slightly over air-conditioned restaurant. 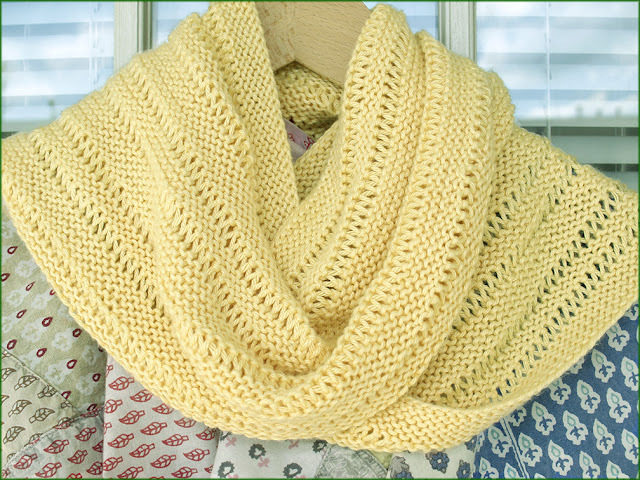 Light, airy and worked in a lovely crisp cotton mix yarn. 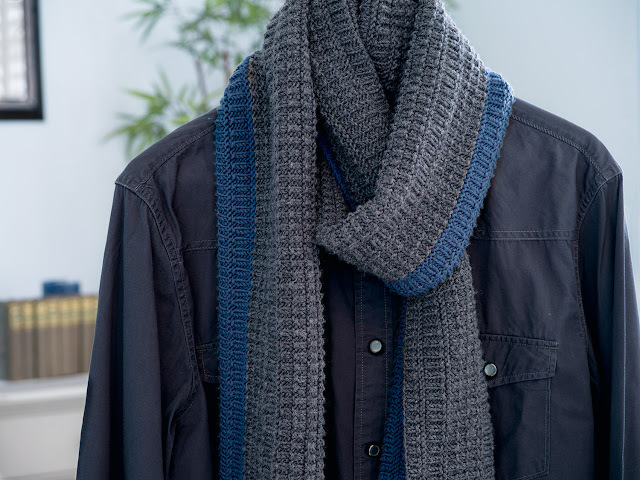 And here's what I'm working on right now: a super-toasty men's scarf also worked lengthwise. This is the Cambourne Scarf and I will be uploading the pattern for this very soon. I finished one of these scarves the other day and am now working on a second version. The scarves are worked in Lang Merino+, a gorgeously soft Aran weight yarn in a wide range of colours. The one above features a deep charcoal colour with a slim dark blue band down the side. The second one still on my needles is a slightly slimmer version with two contrasting greys, the lighter main colour contrasting with the narrow charcoal band. 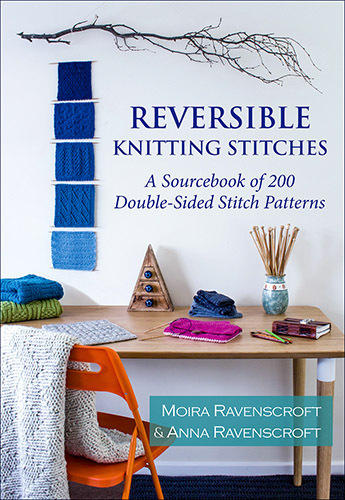 I have used a combination of two stitch patterns from our book, Reversible Knitting Stitches, and love the way the yarn emphasises the textural appearance of the stitches. 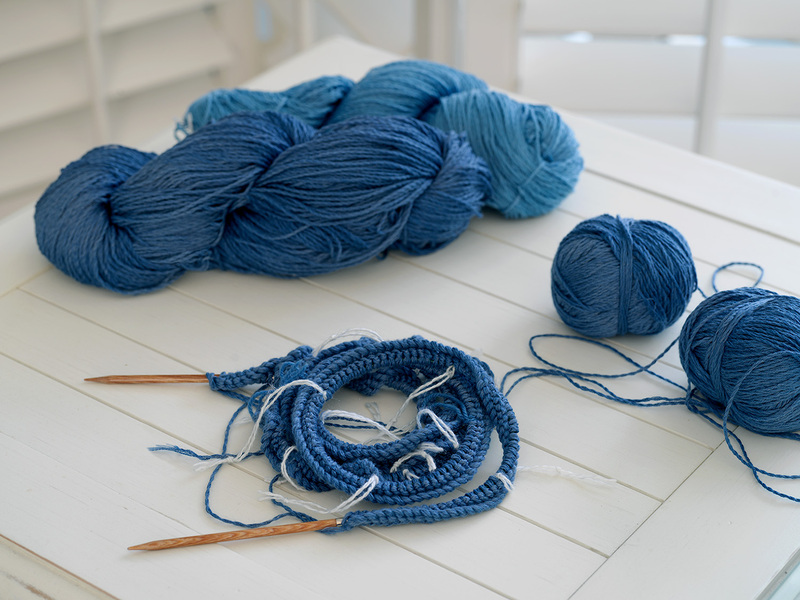 The yarn has just enough sheen to catch the light and bring out the stitch definition. I'll put some more details about this new scarf pattern in my next blogpost. I hope you have enjoyed the first of these Summer and Winter pairings! The next pair of patterns will be two blankets, one just right for a summer beach hut and the other for snuggling under when the snow is falling outside. 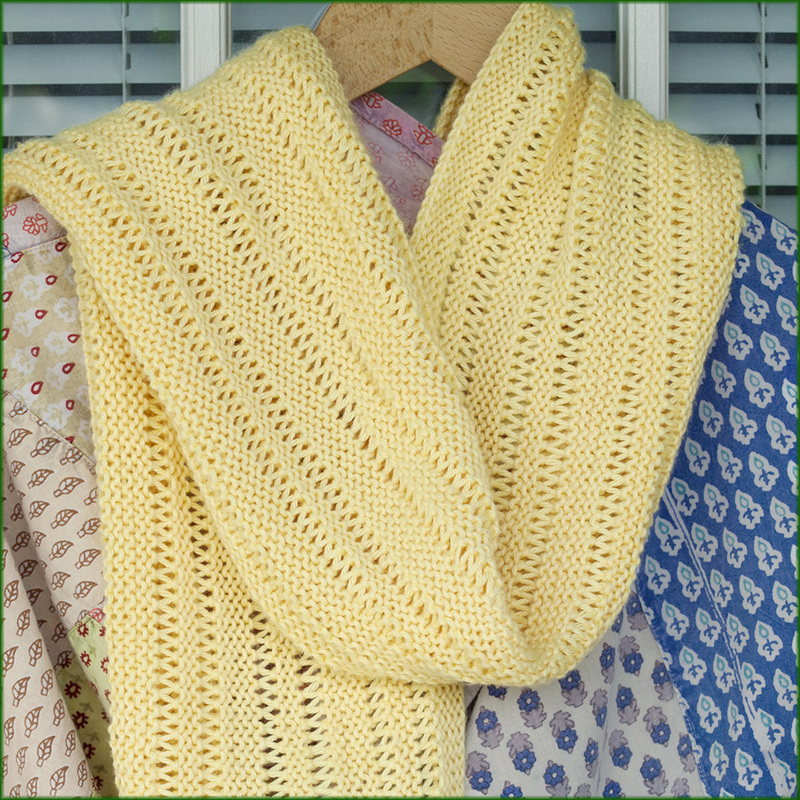 Meanwhile, if you would like more details about the Kimpton Scarf and Wrap pattern, please click here.